Pearl, cultured freshwater (dyed), satin sand, 8-9mm button, C- grade, Mohs hardness 2-1/2 to 4. Sold per 15" to 16" strand. 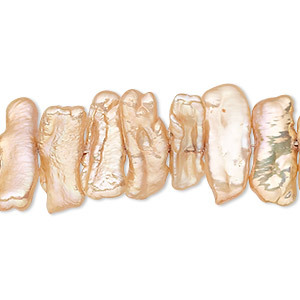 Pearl, cultured freshwater (dyed), satin sand, 4-5mm flat-sided potato, D- grade, Mohs hardness 2-1/2 to 4. Sold per 15-inch strand. Pearl, cultured freshwater (dyed), satin sand, 1.5-2mm seed with 0.2-0.7mm hole, C- grade, Mohs hardness 2-1/2 to 4. Sold per 15-1/2" to 16" strand. 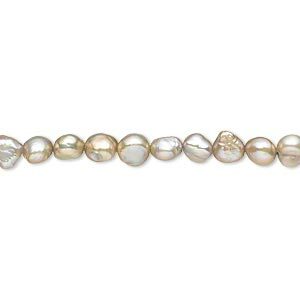 Pearl, cultured freshwater (dyed), satin sand, 12x4mm-18x7mm stick, C+ grade, Mohs hardness 2-1/2 to 4. Sold per 15-1/2" to 16" strand. 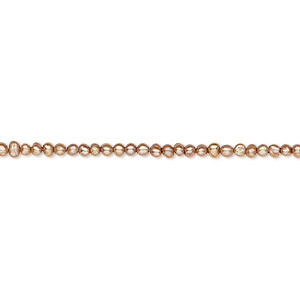 Pearl, cultured freshwater (dyed), satin sand, 18x5mm-28x10mm stick, C grade, Mohs hardness 2-1/2 to 4. Sold per 16-inch strand. Pearl, cultured freshwater (dyed), sand satin, 5-6mm button, C grade, Mohs hardness 2-1/2 to 4. Sold per 15-1/2" to 16" strand. Pearl, cultured freshwater (dyed), sand satin, 6-7mm button, C grade, Mohs hardness 2-1/2 to 4. Sold per 16-inch strand. Pearl, White Lotus, cultured freshwater, peach and mauve, 8-8.5mm button with 1.7mm hole, C grade, Mohs hardness 2-1/2 to 4. Sold per 15-1/2" to 16" strand. 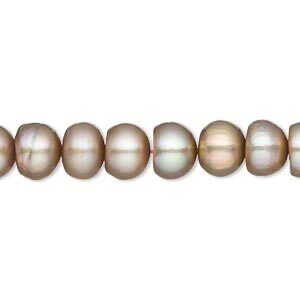 Pearl, cultured freshwater, peach, 5mm button, C grade. Sold per 16-inch strand. 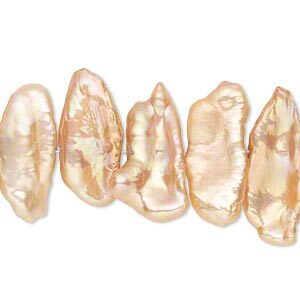 Pearl, cultured freshwater, peach, 6-8mm button, C grade, Mohs hardness 2-1/2 to 4. Sold per 16-inch strand. Pearl, White Lotus, cultured freshwater, peach, 4.5-5mm button, B- grade, Mohs hardness 2-1/2 to 4. Sold per 16-inch strand.